Seventeen-year-old Darcy Prentiss has a reputation, but there’s a lot more to her below the surface. Sixteen-year-old Natalie Payson has unusual nightmares about the town she left and a door that beckons to her. Eighteen-year-old Pearl Haskins is a local resident in a summer vacation town who needs to find the truth about how three of four members of a wealthy family died in a tragic fire to clear the suspicion surrounding her dad, who was their property caretaker. These three fictitious teens have one thing in column: Gillian French. French is a writer of three books all published in less than a year. Her latest, “The Lies They Tell,” was released in April by HarperTeen. “Grit” was released by HarperTeen in May 2017. “The Door to January” was published in September 2017 by Maine’s Islandport Press. Her fourth book, “The Missing Season,” is slated to be released in summer 2019 by HarperTeen. “It definitely was a whirlwind. It all of a sudden just broke wide open,” French said of her writing career. Hearing from readers, she said, has been the more rewarding part. Also exciting is the professional reception the books have received. “Grit” was awarded the 2017 Juvenile/YA Lupine Award by the Maine Library Association and the 2018 Book Award for Young People’s Literature from the Maine Literary Awards presented by the Maine Writers & Publishers Alliance. It also was a 2018 Edgar Award Nominee for Best Young Adult Mystery. Meanwhile “The Door to January” was a 2017 Bram Stoker Awards Final Ballot Nominee for Superior Achievement in a Young Adult Novel. Although French’s publishing success seems meteoric, it came after years and years of writing. She wrote her first book a freshman in high school. It wasn’t published. 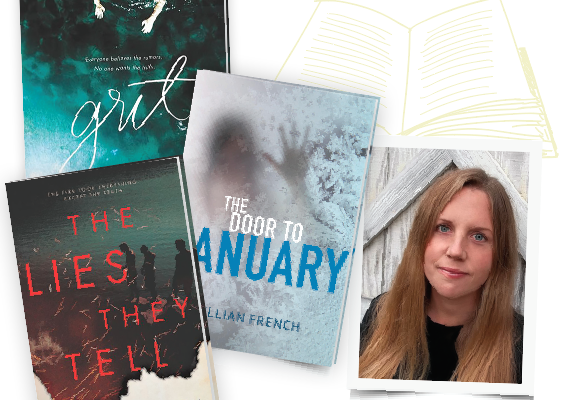 During those years, French tried many things before realizing the stories she wanted to write were rooted in her experiences and memories as a woman from small town Maine. French has done that with her latest novel. She drew on experiences working, both as a librarian and earlier at a midcoast hotel. French noticed that the people who own homes are “in a very different place, mentally,” when in town. They may only visit a few weeks of the year. In “The Lies They Tell,” Pearl Haskins lives with her father in Tenney’s Harbor, a tony coastal town. As year-round residents, the contrast between their scraping-by lives and the privileged lives of the summer people is glaring. When their town becomes the site of an unexplained fire that ravaged the Garrison house, killing four of five family members, fingers point to Pearl’s father, the caretaker of the property. But Pearl doesn’t believe it. She sets out to find the truth, befriending the rich kids she serves at the country club she works at — and putting herself in danger. “You really have to distill your writing down to these little gems. You have to suggest. … You really have to get across the power and the intensity in [these situations] … and you also have a responsibility to your reader to show consequences,” French said. Her next novel will take readers to another small Maine town. “The Missing Season” is set in a fictional Maine town, where a kid goes missing every Halloween, never to be seen again. While adults in the town explain away the disappearances, the kids know the truth: It’s the town’s fabled boogieman called The Mumbler. “The adults all have excuses for what happened to this kid,” French explained. What’s next for French? More words, of course — after a break. She says she’s deciding between two story ideas. And there are scheduled appearances for her books, too. She’s particularly excited about one happening in September. French will be at “Nerdy Evening with Authors and Illustrators” from 6 to 8 p.m. Friday, Sept. 28, at the Morse Street School in Freeport. The annual gathering of writers and illustrators as part of Nerd Camp is a fun time for readers to meet the people behind their favorite books.